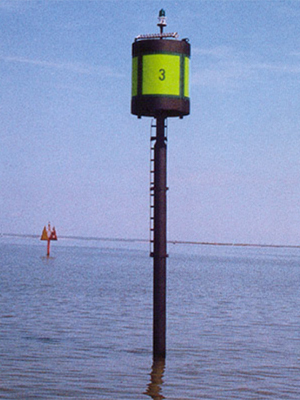 This buoyant beacon combines the advantages of a fixed structure and a buoy without the disadvantages of either. Tension moored and non-rotating, it does not swing in a watch circle and so provides precise positioning of the signal. When bumped by a vessel, this buoy is capable of heeling over to the point of nearly submerging the light with minimal damage to the buoy. Optional anti-fouling paint for the underwater portion is available. Unit is operational in a wide range of depths.